That's right, Surfing Samurai Robots because I think we could all use a little levity about now. 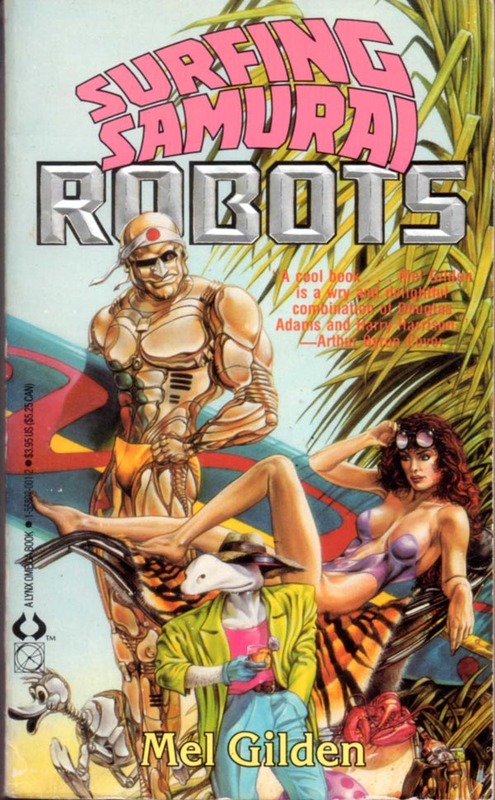 Written by Mel Gilden, Surfing Samurai Robots is the story of a small, white alien with a large nose and an obsession with Philip Marlowe. His name is Zoot and he lands in a future version of LA where, you guessed it, Surfing Samurai Robots are all the rage. That's robotic samurai that surf. It's not a metaphor or a band name or anything like that. When all the SSRs disappear it's up Zoot to find out what happened. It's a deeply silly book as I think this, almost excessively, 90s style cover depicts quite well. On the other hand this book is what got me to read Raymond Chandler. So there's that. I noticed a trend in the last couple years. Hard science fiction novels with mostly black covers and plain white titles. Just take a look at the covers of Seveneves by Neal Stephenson, Aurora or by Kim Stanley Robinson. Then there's the one that started it all, Existence by David Brin. It's a new take on the first contact story. One day a guy, who's job is basically space janitor, is cleaning up space junk when he finds a strange milky white object the size of rugby ball. When he places his hand on it an alien hand seems to come out of the mist to touch the inside surface. From there it's an epic, sprawling story that takes you from the flooded slums of Asia to the artificial private islands of the 1% of the 1%. There is far to much in this to summarize. There are historic, literary and pop-culture references. From Professor Rowling from the Radagast Institute to the super-intelligent dolphins of the Uplift Project this book is full of historical and literary references, nods and puns.